e.l.f. has a new Bath n Body line, wee! 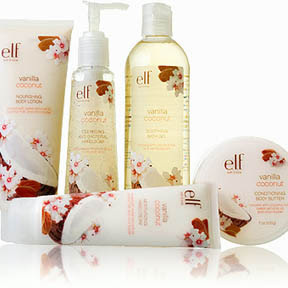 Their line consists of bath gel, hand soap, hand cream, body lotion, & body butter. These come in several scents including pineapple mango & vanilla coconut, among others. The Vanilla Coconut sounds positively luscious to me! These products are $4 each. Can't wait to try it!